My most memorable moment has to be the day last month when we held our very first teen leader meeting to launch Sciencia, the Blue Hill Teen Science Café, under the aegis of the Maine Mathematics and Science Alliance. 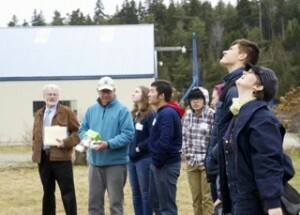 The rural town of Blue Hill is two- thirds up the Maine coast, and has fewer than 300 high school students. 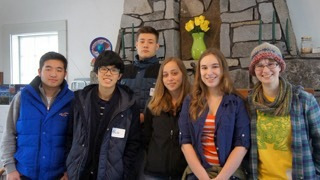 Six first-time members gathered beside a roaring fire in the tiny East Blue Hill Village Library with pizza, questions, and ideas. We are a very international group: Chinese, Russian, English, and American, with STEM Guides from Australia and Philippines. The name Sciencia confirms our global outlook; it is our interpretation of the Spanish word Ciencia, “knowledge of science,” with an “S” on the f ront to make it ours. If all goes according to plan and weather (i.e. snowstorms) permitting, the first TSCN event will be in February. “Eyes In The Sky” is all about drones and features a speaker who has spent his professional life as an electronics engineer on U.S. spy satellites, including “Big Bird,” a Cold War project declassified just three years ago. 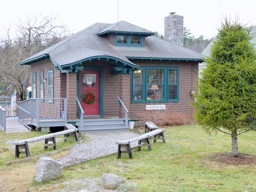 The photos show the founding leadership team members, the tiny East Blue Hill Library where we meet, and a chilly day recently when we previewed our first two TSCN speakers and watched a drone demo. Veronica Young, Stem Guide with the Maine Mathematics and Science Alliance, directs the Blue Hill Teen Science Cafe, one of three sites in the Teen Science Cafe for Me! node.